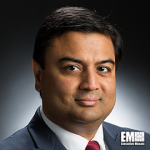 Vishal Giare, formerly a program area manager at the Johns Hopkins Applied Physics Laboratory, has been appointed as APL’s mission area executive for air and missile defense. He now leads the laboratory’s efforts to develop ballistic missile defense and anti-air warfare systems for U.S. forces and allies, APL said Thursday. Giare previously served as program area manager for Aegis BMD and managed agent activities such as combat and missile systems engineering; system development; testing and evaluation; and introduction of systems to military users. The 20-year missile defense technology veteran also held the role of agent and technical adviser to senior U.S. Navy and Missile Defense Agency leaders. Giare holds a bachelor’s degree in physics from the University of Tennessee and a master’s degree in electrical engineering and physics from the University of Michigan.